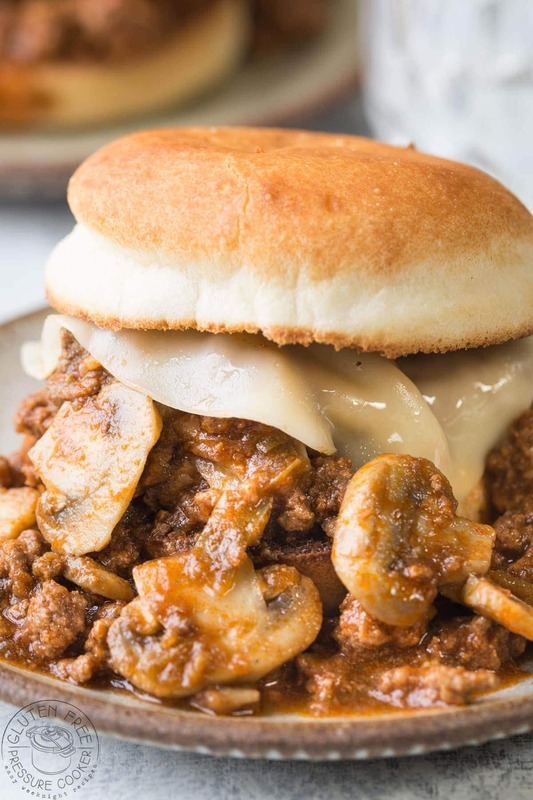 Instant Pot Philly Cheesesteak Sloppy Joes – this recipe is a fun twist on the regular sloppy Joes recipe. I’ve adapted it for the pressure cooker and tweaked the flavors a little to get that some more of that Philly Cheesesteak vibe going on! My Instant Pot Philly Cheesesteak Sloppy Joes are gluten free and can be made in around 35 minutes or so from start to finish. This recipe is for 2lbs of ground beef and if your pressure cooker is large enough you could double it and freeze some for later, or if you have one of the newer 3QT Mini Instant Pots you could easily half the recipe, the cook time remains the same either way. This is a really simple weeknight recipe, but I’ve included a few quick tips below to ensure your recipe works really well! Always crumble the ground beef before you add it to the pressure cooker so it doesn’t cook into one big solid lump. Traditional Philly Cheesesteak has a lot of bell peppers with it, so if you prefer you can add another bell pepper to the recipe. Toasting the bun is a must! Especially if you are using gluten free buns like I am, it really helps to stop the bun becoming soggy once you add the meat. We used Provalone cheese but you can change it up and use a good mature cheddar instead. I prefer to use a good organic ketchup, we use Annies Ketchup for this recipe as it’s not as sweet as regular ketchup and the flavor is nicer. This recipe is not super sweet but you can easily adjust the sugar up or down to suit your own tastes. 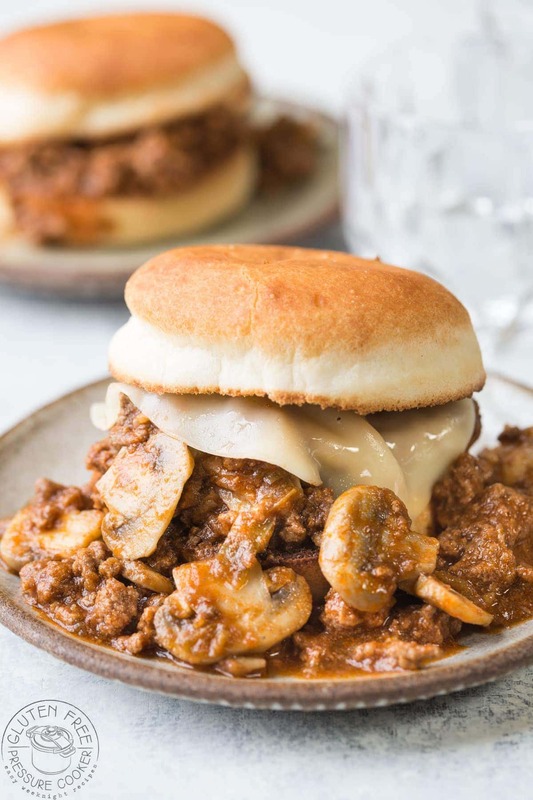 Really tasty Instant Pot Philly Cheesesteak Sloppy Joes that your whole family will love! Saute the mushrooms in your Instant Pot with a little olive oil, set aside and drain any liquid that they produce when cooked. Next, add a little more oil and then cook the onions and bell peppers until soft, takes about 5 minutes. Add the garlic, salt, Worcestershire sauce, and stir well. Next, add beef broth, apple cider vinegar and stir in the ground beef making sure you add it in broken up into pieces, not in one big slab. Then add the tomato paste on the top and stir well. When the cook time time is up allow the pressure to drop on its own (NPR - natural pressure release) for about 10 minutes, then release the rest of the pressure and open the lid. After you open the lid use a couple of forks or a potato masher to further break up the ground beef, then add the tomato sauce and ketchup then stir well. 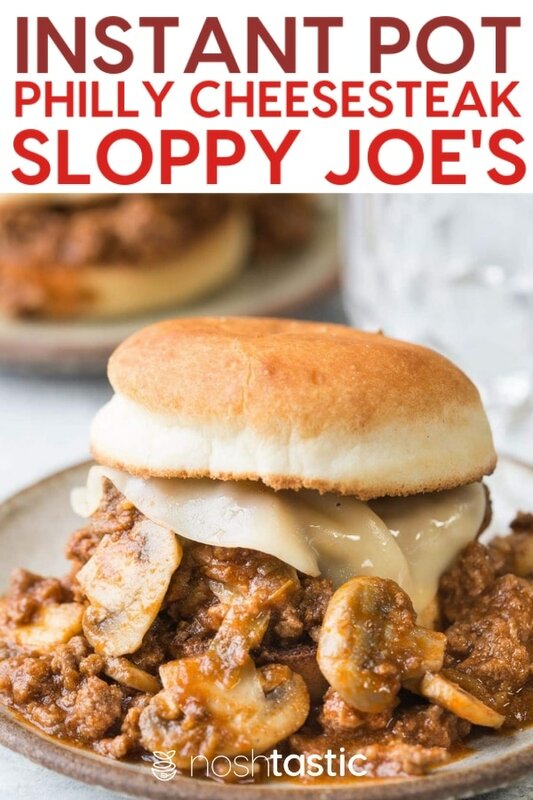 Your Instant Pot Sloppy Joes will still be fairly liquid at this point, I find it's much more flavorful if you let it simmer on a low heat (I chose the lowest saute setting on the Instant pot) until the liquid reduces and it thickens up a bit, it will take around 15 minutes. In the last minute of cooking stir in the cooked mushrooms. Toast some gluten free buns and top with some of the meat mixture, add a slice of provolone cheese and melt it under a broiler. If you are serving several buns you can put them on a large sheet pan and melt the cheese on several at one time. Serves 8, the nutrition label is approximate only as it will vary depending on the brands you use. It does not include the burger buns, it does include provolone cheese. I’d like to cut this in half to 4 servings. How will this affect the cook time? 5 mins instead of 10? Thanks for your help! The cook time will remain the same for the pressure cooker part, but it may take a bit less time for you to simmer it because the volume of liquid is less.